Roger Federer, 2013 U.S. Open: The greatest tennis player of all time has become mortal. Now maybe we can finally appreciate him. The greatest tennis player of all time has become mortal. Now maybe we can finally appreciate him. Roger Federer during his fourth-round loss to Tommy Robredo at the 2013 U.S. Open on Monday. For the thin brigade of fans still on the fence about whether we have truly reached the final stage of Federer’s career, this match made that reality impossible to deny. It was a brutal loss, a naked collapse of nerve, in which Federer absurdly failed to convert any of his last 12 chances to break Robredo’s serve. The loss means Federer’s 2013 grand slam season is over, the first in a decade in which he will not have played in a final. And yet it is only the beginning of September: Four long months remain for us to mourn Federer’s decline, and to convince ourselves it doesn’t hurt, when it does. As he reaches his golden years, this ethereal quality now looks more like fragility. Jim Courier suggested that Federer’s testing of a new, larger racket this summer showed weakness in the locker room. Chris Evert opined that to extend his career, Federer must become what he has never needed to be: a “grinder” like, well, Tommy Robredo. Implicit in this was the accusation that his 17 major championships required little more than getting out of the way of his own gifts, as if he were a blind man with a very sharp sword. It is odd to be damned for one’s own excellence, to be stung by words like natural and instinctive, which now fall somewhere between backhanded compliments and veiled insults. It’s easy to forget that Federer was, by the standards of his era, a late bloomer, having spent his first professional years taming his temper, winning his first major when he was nearly 22. Before then, as he recalled in his Monday night press conference, “People thought, Did he even try? Does he care much?” These questions stopped during his prime, but they have returned now as a kind of ex post facto explanation for a string of losses to inferior opponents. The record shows he is a dedicated practicer, one of the best-conditioned and best-prepared players on tour, and someone who cares deeply about his legacy (see that ridiculous monogram). And yet, despite all this evidence to the contrary, the tendency has always been to interpret his composure as a kind of sublime innocence, as if he paid no attention to who stood on the other side of the net, and won because of it. This is the essential paradox of Roger Federer. In assigning his achievements to a divine power, we dispossess him of his talent and the work he’s done to exploit it. This impossible standard—Fed-liness is next to Godliness—makes his failings that much more stark. We are, as he put it, “shell-shocked” when he plays badly. It disturbs our sense of order. It is why some would like Federer to retire now and spare himself the embarrassment, when the actual desire is to spare ourselves. As he struggles now, we can at last appreciate how difficult it truly is to beat someone like Tommy Robredo, and to do it easily, every single time. It requires grace and precision, but also doggedness, a quality that can be hard to discern beneath a cream-colored, monogrammed blazer. Before Monday night’s stirring five-set win over Milos Raonic, the exquisitely talented Frenchman Richard Gasquet was 1–15 in fourth-round matches at grand slams. 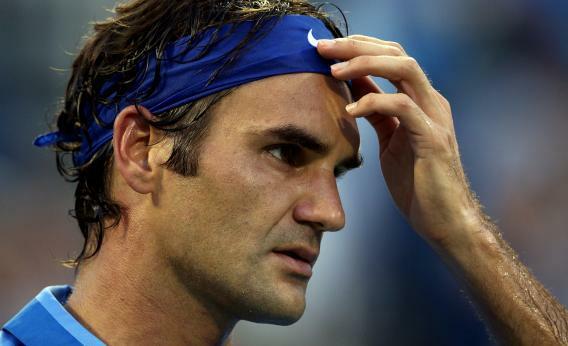 That could’ve been Federer: beautiful game, iffy work ethic, not-so-beautiful mind. But it never has been. None of this eases what was a seasickness-inducing performance Monday, and a difficult summer overall. But every other player has gone through similar stretches. Nadal’s recent run of form follows a seven-month absence. If Federer had taken the last three months off instead of fighting through a bad back, a fourth-round exit might have looked like a qualified success. What we are missing, then, is a satisfying way to think about the twilight of Federer’s career, left instead with the sadness of watching as all the rungs he climbed, and all the records he accrued on his way up, get snapped on his slide down. Is this really how it’s going to end, in a flameout? Or should we still hold out hope that the Federer of old will return, if only for a moment? Between these two possibilities lies a third, the most likely. This past year was neither a shuddering implosion nor a setup to a final blaze of glory, but merely a blip during what has been a slow and steady drop-off since 2007. And for all the suggestions to improve his game technologically, strategically, and psychologically, nothing can be done. Monday’s outlier loss was just another milestone (growing closer together, as they tend to) linked to 2008’s famed Wimbledon defeat to Rafael Nadal, and to the 2009 Australian final, a five-set loss, again to Nadal, that presented us with one of the most moving moments in tennis—Federer’s tears, his choked speech, all of which is tempting to read now as a dawning awareness of the end. A combination of the nagging back, the lost step, the jangled nerves, of nothing in particular and everything at once, is leading him down the path that every great champion inevitably takes. But Federer should play on. The fourth-round exits will soon turn into third-round exits, and the third-round exits will turn into second-round exits. Maybe then we will be able to applaud and appreciate even his brief appearances at Wimbledon, the U.S. Open, and everywhere else. That the greatest tennis player of all time could keep playing past his expiration, undaunted, and outlast his own legend—that would be something worth celebrating.